If you are a parent with a child learning guitar or any musical instrument for that matter its important to understand the reasons your child may possibly decide to quit. There are of course many reasons why a child might fail to learn to play guitar but if you are a parent I want to point out just 3 reasons that if understood can often be avoided. Results can take time and are somewhat unpredictable. When students focus too much on results they can easily become frustrated and want to give up. Instead we should encourage children to focus on the practice because this is achievable. For example if I say to a child that I want them to be able to play this song by next week verses I want them to practice this song for 30 minutes a day which seems more achievable? The 30 minutes a day of course. If I had said the former and after a few practice sessions they were struggling with the song they may very well become frustrated and even conclude that guitar is too hard. When children learn guitar they often don't get the fact that they are learning. They falsely believe its some kind of test. They think that they can either do it or not. When they fail after a few attempts their confidence drops. Watch children with a new game or puzzle. If the puzzle is not easily solvable they will generally move on to something new. There is no doubt an evolutionary reason for this but when it comes to learning a skill confidence matters. When a child loses interest what is generally happening is a loss of confidence in their ability to master the challenge. The remedy is to adjust the level of difficulty by giving them steps. Creating easier exercises is the best solution which leads me to the 3rd reason children quit guitar. Parents who meet and discuss the ups and downs of their child's motivation to practice guitar dramatically increase their chances of success. You might be involved at home and even attend lessons but its important to speak to the teacher and communicate any problems you see. Guitar teachers work with children everyday and will usually be able to recommend a workable solution. The problem sometimes is that teachers don't know what is going on at home so its important to speak up. Early in my teaching career I would expect a few phone calls at the end of each term from parents saying their child wasn't continuing lessons due to a lack of interest, practice, progress or a combination of all three. In many cases it came as a complete surprise and I had no idea the their child was struggling at home. I realised after a few years that I needed to ask more questions and communicate more with parents to avoid this situation and it worked. My student drop out rate decreased dramatically once I began communicating more with parents but it works both ways. Have you spoken to your child's guitar teacher lately? 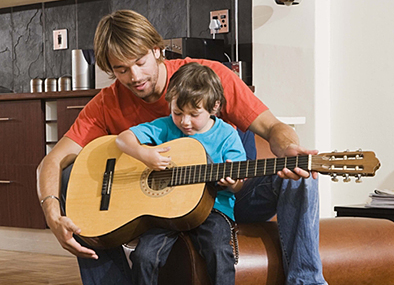 *How do I get my child to practice guitar without forcing them?